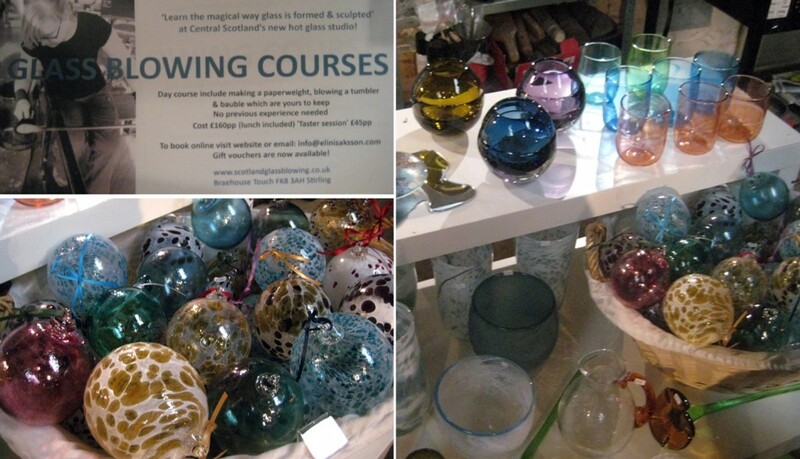 Had mentioned finding a glassblowing course in my October update. Initially, it was the only class I could find near Edinburgh. But with further looking, it was one of the only I could find in Scotland! Lucky it’s so close by! 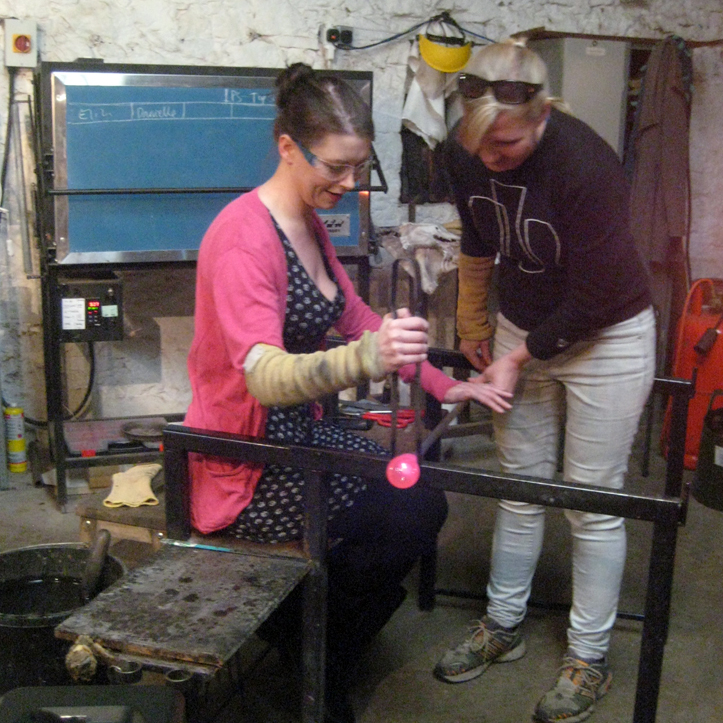 Elin Isaksson, a Swedish glassblower based in Stirling, offers taster courses in glassblowing. She also offers full day courses (where you make a bauble, a tumbler and a paperweight), but the taster class (just a bauble) is a fraction of the price, so thought I’d try it first before investing further. Plus with the prospect of being able to make my own glass bauble just in time to go up on our Christmas tree, I signed right up! My pal also fancied it so I had a wing(wo)man – double trouble! 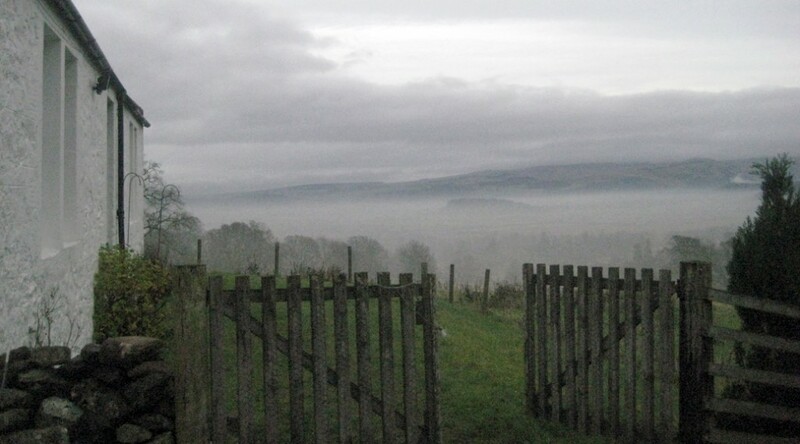 We managed the interesting drive down a very rural road in the countryside near Stirling. It must be properly brilliant to get to wake up with your studio right outside and nothing else but farms and fields as far as the eye can see. She showed us how she would heat the steel blowpipe first so that molten glass would stick to it. Then she took the glass on the rod to the bench, where she rolled the rod evenly while cupping it with a block (which was actually a wooden cup-shaped thing with a handle. The wooden cup was soaking in some water so it wouldn’t burn when it came into contact with the super-hot glass). She puffed a few breaths of air through the blowpipe and started shaping the bauble, but the glass very quickly got too cool to blow anymore air into, so she put the glass into this CRAZY hot furnace called a glory hole, which is used to re-heat the glass so you can keep shaping it. She then blew into it a few times more and rolled it at the bench while using the jacks (a big pair of tweezer-shaped tools) to start to sort of mark off where the bauble would be ‘cut’ (off of the blowpipe). As she squeezed, you could really see the bauble taking shape. Then finally when it was the shape she wanted, she took the bauble on the rod to a table with a sort of prepared cup and knocked the rod ever so slightly with a stick, and the bauble fell perfectly into the cup. She then took a chuck of molten glass from the furnace and stuck that on top (looked like a Hershey’s kiss!) and made a wee curl so that we could hang our baubles. The baubles then got put into the annealer – a sort of cooling box. It’s very hot (everything is! A perfect place to hang out in winter! ), but decreases temperature over time, allowing the glass to cool gradually so that it tempers properly and won’t shatter. This means we have to wait for our wee baubles to arrive in the post! Very exciting. My pal giving it a shot like a pro! THEN we all got a turn each! My pal was very brave and went first. She did an amazing job and made it look super easy. Then I got to give it a go! Tricky stuff! Especially hard to keep the rod rolling while also pinching the jacks into the glass. That said, the trickiest part for me was probably blowing air through the blowpipe before the glass got too cool to shape. I think I had to do it like 4 times (reheating in the glory hole each time) before it was the ‘right’ size. And then it’s all about controlling your breath depending on how hot (and therefore malleable) the glass is. So much to think about all at once! First puff – not much! Another attempt at blowing up the bauble! I had an amazing time at Elin’s class, and so glad to stop by her studio before Christmas – she was having a sale so I managed to buy a lovely glass pitcher for a steal off the normal price! I’ll post a photo of the pitcher, and my bauble once it arrives. Am starting to save my pennies for her full-day class. *double-thumbs up* If you’re in the area, you should too! Or at least try the taster class – I definitely recommend it. Hi Mary Jane! Thanks for getting in touch. I’m not 100% sure of the age requirements. Her workshop page (http://www.scotlandglassblowing.co.uk/glassblowingcourses.html) says 16yo minimum for the day class. But probably worth getting in touch with Elin directly if you just wanted to stop in? Reckon the age limit is for health and safety reasons though as boy was that glass hot hot hot! Hope you can try it out though. Was amazing to do!